Postures of Making is a research and development project which is centered on working collaboratively with ergonomics scientist Dr Valerie Woods. Together we will explore the workings of the creative practitioner’s body when engaged in art making. Val and I will be using this blog to map our collaboration, the focus groups we will be facilitating and contextual topics which relate and feed into our thinking. NN: So Val, we are in the final days of the project and for me it feels like we have covered quite a lot of ground. Two case studies, 2 focus groups and 3 studio visits, in amongst plenty of dialogue and experimentation. It has been fascinating to start to understand the detail that ergonomists go into when making a study. Right back at the very beginning when we first met I can remember me saying I think we will see that artists and craftspeople will have a variety of different postures and you said you expected to find similarities. From the project I learnt it was the tasks that were varied, the combination and grouping of tasks were different, but that actual movements and postures had lots of similarities. Movements such as pinch, twist and grip were commonly seen. I quite like this as it puts art practice labour alongside a wide range of other occupations, more comparable and less elite. Was there anything you found out from the project that surprised you? VW: Observing and discussing the work of the makers and artists in this study has been fascinating from many perspectives. Although my main focus has been on postures adopted while working, the wider aspects of their work have also been incredibly interesting and often surprising to learn about, e.g. their work-life balance, their social interaction or lack of it, their working environments. Yes we have identified postural similarities between artists who conduct very different work but have also have seen similarities with other non-art professions, e.g. seamstresses. I agree there have been lots of pinch grips! We have also observed much wrist flexion and extension, and a significant amount of radial and ulnar deviation of the wrists. Not surprisingly, many of the tasks we have observed the makers conduct have been quite meticulous, often requiring dexterous finger movements and most of the tasks observed are visually intensive. Arms are often unsupported and abducted. We have also seen force being exerted, sometimes in awkward postures. In general the back and neck although often flexed have been held static throughout the sometimes quite long tasks we have observed. We saw more back movement during our last studio visit to a basket maker, which was considered to be a multi-limbed task. We also discussed pain with the makers and there appears to be quite a high prevalence of upper limb discomfort experienced while at work. Was this more of an issue than you thought it might be? NN: Before I answer your question I have to draw attention to the detail in your reply above. The way you have written about the body in the movement of making is so interesting, the terminology is so far from a vocabulary that I would normally use in my art practice. Yet we were both there, looking at the same thing, during the studio visits, and the focus groups. The case studies are of two of my artworks and I would never think of describing them in the terms you have used. This is why I wanted to work with you, to open up a new way of seeing, the case study documents you have put together with numbers and graphs, timings and analysis; movement is being described in such a different manner. To answer your question I think what I noticed most about the pain and discomfort was for many, the mainly temporary nature of it, and that most people learned to live with it, knowing taking a break would ease the symptoms. During the studio visit with Les, I was fascinated by the pain he described as originating from using a big heavy printing press some 20 years previously; reappearing with the light touch activity of using a computer mouse. So that’s a useful insight, it may not simply be a case of no longer using a particular process because it causes pain, that may not be enough, the pain may simply re-appear when undertaking another activity. It’s a cautionary note for us to take care of ourselves, as you pointed out in one of our discussions, self-employed people are take sole responsibility for their health and wellbeing. From talking to practitioners during our project I found the discussions about autonomy with work set-up and task selection to be really interesting. How does this differ from some of the other studies you have undertaken where there is less autonomy? VW: Yes I agree, as I recall I think nearly everyone we talked to during our study mentioned some pain and discomfort but seemed to manage it by taking breaks; however most said when there is a deadline there is no option but to work through it. Thumbs, wrists, hands, shoulders, backs were the most prevalent areas of pain and discomfort. I think given the varied tasks that the makers undertake it is difficult to avoid. As well as close, intricate, static work that many conduct, there is often an element of manual handling in their work, whether it’s carrying the final product or equipment or moving materials like large bags of clay or they might have to hold a heavy tool for a substantial amount of time in order to conduct their work. One person we observed held a heavy piece of equipment at an awkward angle while conducting a specific task as the cable for the tool was not long enough to allow a more comfortable posture. Further, I noticed during our studio visits that even when back support was available it was rarely used. Some of the young makers we talked with in the focus groups who are starting out on their careers had limited funds to spend on setting up a good workspace and this might contribute to the occurrence of pain and discomfort. Problems can be cumulative and long-lasting if they are not managed. I am hoping some of the ergonomic sessions during the focus groups might have been of some help to encourage them to think about their workstation set-up but also to think about the structure of their working day. This leads me on to your question, I think that artists and makers like many self-employed workers are incredibly lucky to be able to organise their work content, work pace and schedules, and their working environments. This takes discipline and also is not easy from a financial aspect, particularly at the start of a career. I have met many different types of workers whose work control has varied from none at all (e.g. assembly line workers) to those with a lot of job autonomy and flexibility (e.g. journalists). Most workers had to meet deadlines during the work just like the artists and makers; however the people who we have met during this study are different in that they are in charge of their whole working life from small but important things like sourcing a chair or a work desk/bench, to ensuring their work environment is suitable for their work, to organising their accounts etc. It’s really daunting although I imagine incredibly rewarding. I am sure these are issues that you have experienced in your work too. 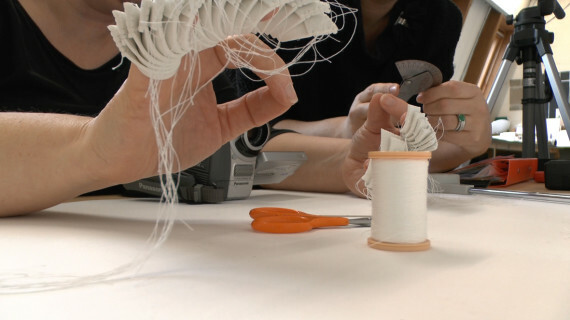 One area that I think is particularly difficult for many artists and makers to get right is the working environment – temperature, lighting, ventilation, noise – it can be very expensive to get these conditions right and this might be an area that is out of their control, for example if they are in a shared, rented workspace. Would you agree? NN: I think this is a really good question. Studio provision for artists can be poor, the best studios are expensive and out of reach of many artists at the start of their careers, the cheaper studios are often shared, cold and temporary. Sometimes the temporary nature can extend for years but having a studio on that premise can be a real headache – the thought of having to move at short notice. I set up a research project a few years ago, visiting artists in their spaces and talking to arts professionals about ‘the studio’. Those with shared space often talked about the noise as being a real issue, having to listen to other people’s music or radios. It can be very distracting and some studio complexes have a rule that if anyone is in at the same time music gets switched off. Security can be an issue also, as studios can be temporarily adapted from other uses so leaving expensive kit overnight isn’t advisable, this means carrying a lot of stuff around. I’ve also had some very cold and damp studios in my time, my current studio is in a sign makers, there are other artists dotted around the building but I rarely see them if ever. I don’t ever feel like I’m solitary working as there are always other people around but I can always close my door if I just want to get on. I couldn’t do all my work in this studio though, it gets too chaotic and it’s pretty grubby in places so I have an office at home too for clean work – digital work, administration, emails etc. I quite like having these two spaces, and separate tasks for each. I don’t have the Internet at the studio and although I take my laptop its good as I don’t get distracted by internet browsing or emails. So working across two spaces works well but sometimes I am in one space and need something from the other and with a 30 minute walk between the two it isn’t always practical. But there is never an ideal working situation for anyone, regardless of the industry or profession they work in, there are always issues to address or manage, it’s just the way it is. As the final art works are being fabricated I am thinking about the new audiences we can reach with the project work. Its visual nature offers a different entry point into the subject of ergonomics, when you have worked on research projects before would the end result usually be a report? Who would the main audiences be and how would you access them? VW: Smaller research studies would result in a report to the company who commissioned the study. It might also be possible to write a paper based on the study for publication in an academic journal or for presentation at a scientific conference. Most of my large research studies were conducted for the Health & Safety Executive (HSE), their reports are all ISBN publications published by HSE Books and are also available to be downloaded from their website. These are detailed research reports. Aspects of these reports were turned into papers and presented at national and international conferences and also published in academic journals like International Journal of Ergonomics, Applied Ergonomics and Occupational Medicine. Sometimes we would write articles for health and safety magazines. Generally the results of our studies were presented to academic audiences. However when we completed a two-year study investigating the musculoskeletal health of cleaners, which was funded by the HSE & UNISON, we thought it important to take a different approach. As well as presenting the findings at conferences and publishing in journals, we held a one-day seminar to disseminate the findings to the cleaning industry and invited many people from different parts of the industry to participate – trainers, equipment manufacturers and suppliers, safety reps, managers etc. This participatory approach enabled participants from the cleaning industry to share workplace experiences, including work organisation and health strategies that had already proved effective as well as discussing new ideas and approaches and the findings of our study. The major seminar outcome was a request from the participants for the provision of industry guidance – something that would actually be useful for the day-to-day management of the health of cleaning staff. With funding from the HSE, this resulted in Caring for Cleaners – Guidance and case studies on how to prevent musculoskeletal disorders. Another particular interest of mine is social support at work and the positive effects of this on health and wellbeing; so I have been interested to learn about social interaction and also social isolation at work from the participants in our study. Often artists and makers work on their own, but might share a workspace or some may collaborate. What were the main feelings about social support you learned from the interviews and discussions we conducted during the focus groups and studio visits with respect to people’s experiences of working on their own? NN: I can remember it being a mixed bag of responses to lone working. Some said they really enjoyed it, loved working on their own, but they also had opportunities to talk about their work with someone at the end of the day. Quite a few people work from home, studios in garages or in purpose build studios in their gardens, so work was mingled with family / friends lives. Some ran courses from these spaces so at particular points working in isolation would be broken. Most of the designer makers we spoke to, talked about how in addition to working on a self employed basis they also worked for other designer makers or in associated industries. This work opportunity was also an opportunity for social interaction. There were some people who found solitary working more challenging, but they had identified strategies to manage this, they engaged in sport or trips to the local library to get out of their workspace at specific times during their working week which interrupted the solitude. I know from wider conversations before we started the project that working in a solitary manner can be very important, this was particularly true for people with caring responsibilities with children and that solitude gave them uninterrupted thinking time. Thinking time is an interesting area in relation to solitary working, as this kind of work may take place away from the studio, when commuting or out for a walk, in a solitary manner or through conversations with a friend or peer. This leads me to think about when work starts and stops and how a work life balance does or doesn’t work for those with creative disciplines. Practitioners may not always be ‘making’ work, but as making is thinking when work starts and stops is hard to define. Would you like to close our discussion with some thoughts about work / life balance? VW: With regards to thinking time and work-life balance I think the art practitioners are actually similar to other workers, particularly other self-employed workers, but actually I believe that a blurred life-work balance is becoming the norm for many. It is increasingly difficult to draw a line between work and non-work time. Instant and constant communication via text, emails and other forms of on-line contact has contributed massively to this. The need to respond to these communications outside work time is a huge pressure for many people. Also our immediate access to vast amounts of information via the Internet means that ideas can be explored and investigated at any time and anywhere. In addition, many people now work at home full or part-time so the balance between work and non-work time can be easily blurred. Nicola, this has been a fun way to round up our study. We have met some fascinating artists and makers who have been very generous with their time and very patient with us as we asked them to demonstrate their methods over and over. I have learnt a lot from observing and talking with them and have been so impressed by their dedication to their craft. NN: I agree we have met some really interesting people and they answered our questions with honesty and generosity. We have already spoken about what we would like to do next, so I’m looking forward to continuing the conversation and the collaboration and seeing where we go with things next. 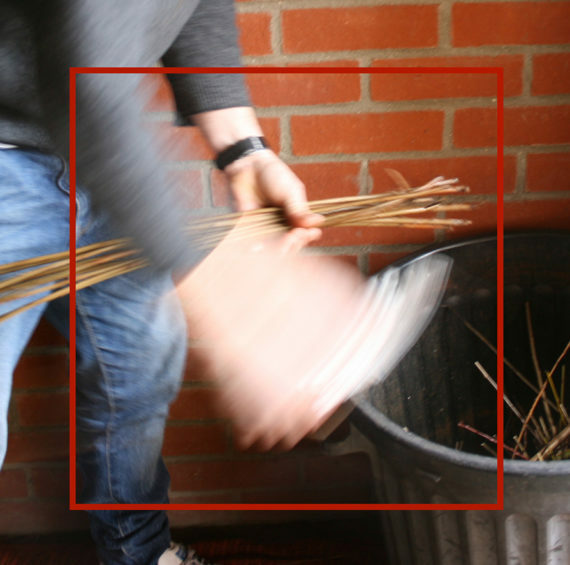 One of the first things that Jonathon Carrie of Norfolk Hedge Baskets says when we arrived for our final studio visit of the project is ‘basketmaking is a multi limbed craft’. Immediately intriguing we were able over the course of a couple of hours see this statement demonstrated. The making of a basket involves a variety of different postures, stages, skills and tools. The workshop is a garage, light comes from both a florescent light which works intermittently and from the natural light from the open garage door. Having the door open also means being open to outside temperatures. It was about 9°c when we visited, Jonathon says he can work in temperatures as low as 4°c, any colder and the willow gets too cold to work. He talked about his workspace never feeling big enough and spending time re-arranging to make the best use of the space. In the summer he will work outside more, in February when we make our visit it’s a cold dank day with a heavy misting of rain. 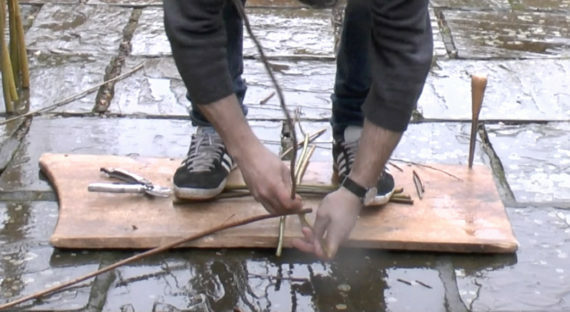 The making of the basket bases happens outside, seemingly regardless of the weather, the length of the withies being used makes this by far the best option. When Jonathon demonstrates this part of the making process and we take photographs it is hard to understand how his hands are actually working. It’s Val who asks which hand is exerting most of the force, the reply that it is the left is a surprise. 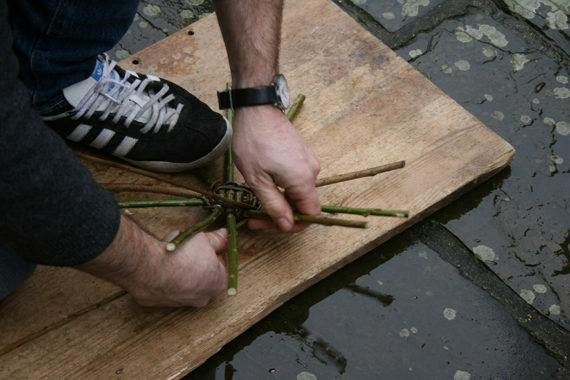 The right hand guides the willow, the left had pushing, manipulating, securing the weave as it progresses. 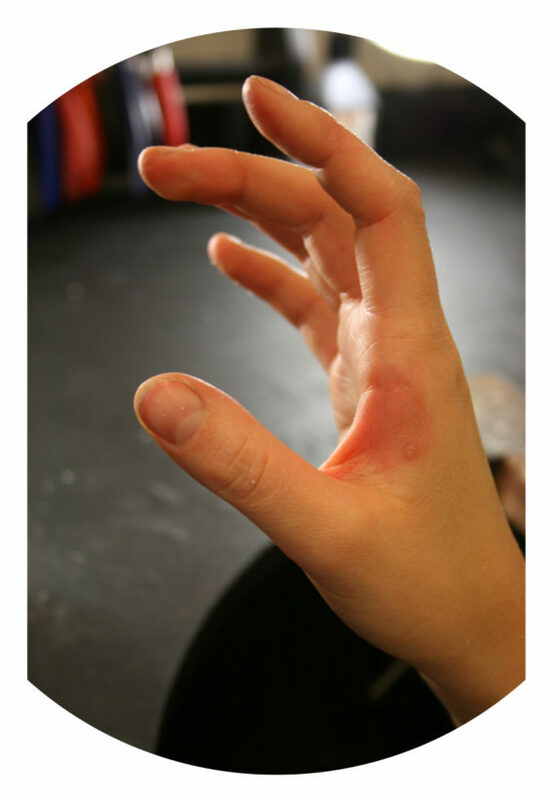 When asked about any pain and discomfort it is the thumb cushion on the left hand which highlights its overuse through aching for a while after intensive working. 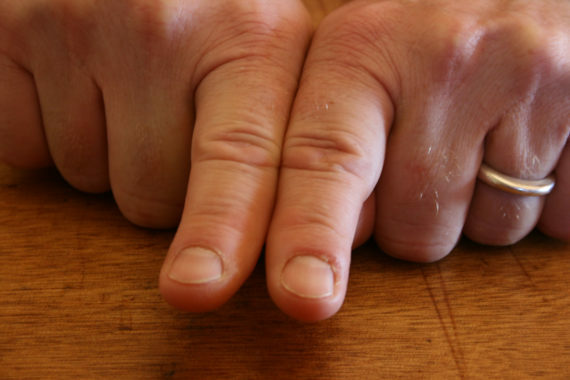 This is where the Opponens Pollicis muscle comes into play, rotating the thumb into opposition with the fingers, together with the rest of the Thenar Eminence muscle group in this area of the hand it supports the opposable thumb to fingers movements (1). The aching is short lived and in fact all the pain or discomfort described was temporary in nature. The speed of working is incredibly fast, the hands look very dexterous and although there is clear attention to the construction pattern this process doesn’t include close work. To make one kind of base involves kneeling on the board, using one foot to clamp the work in progress whilst kneeling with the other leg. It looks quite uncomfortable but when asked Jonathon says its not. This can be true for many making processes, postures may look demanding on the body but it doesn’t always follow that they are, the body can be an incredibly adaptable and tolerant entity. The second kind of basket base involves standing up using the weight of the body to again anchor the work so the weaving can be carried out in the initial stages before going into the kneeling posture one again. Moving into the garage, the rest of the basket is made on the bench. Some people sit on the floor to make a basket, as Jonathon did when he was first learning. Using the bench is about convenience, everything is to hand, the work bench holds tools to the right hand side, willow laid on the floor to the left. This simple layout makes a positive contribution to efficiency and productivity. Workplace set-up is important component of ergonomics, how easily tools are to hand, where raw materials are, the types and frequency of movements between tasks. When observing the bench posture, the back is held well, there is no slouching or rounded shoulders to be seen. Again the movements are quick and dexterous, there is an unconscious competency at work here, the hands instinctively know what is required. In Richard Sennett book The Craftsman, he writes of “craftsmanship being founded on skill developed to a high degree and one commonly used measure if that of the ten thousand hours of experience required to produce a master” (2). It might be an automatic response to consider these hours being manual in their nature but of course they can be conceptual also. The combination of hand and conceptual skill creates a mastery of process, material and method of working, from this innovation can flourish. At the very outset of Sennett’s book is a short phrase “making is thinking” (3). It is too easy to consider making as a purely physical activity for as the hands work, the mind works also. I wondered if Jonathon used batch production processes, for example making lots of basket bases to then work up but generally he starts a basket and completes it in one go. The length the construction process varies depending on the size and type of work being made but what striking is the ability to complete an object in a single work shift and by the end of the week have sold it to a customer. Jonathon described the rhythm of his week, with particular days having a clearly defined tasks; making, selling, running courses, business administration. Each day or section of a day has a clear purpose and with his attention to planning and preparation, there are markers which indicate correlations with the components of job satisfaction; skill variety, task identity, task significance, autonomy, and feedback (4). We witnessed four out of five of these components with Jonathon describing how he sells work direct via stalls and at events, so interaction with customers generates feedback. Out of all the people we have interviewed, visited and talked to over the course of the project this is the shortest work cycle, from raw material to object being made to then being sold. During our visit we observed a making process which demonstrated knowledge in action, skills which were fluid and fluent and a work set up which contributes to productivity and efficiency. We also observed how basket making is indeed a multi limbed craft; a basket will never look the same again. Our thanks to Jonathon for hosting our visit please visit his website for details of baskets for sale and details of courses. Studio visits are reflection points: with the holiday season spent totally ignoring my practice, getting back to the studio and looking at the work I have produced was a welcome activity. Periods of inactivity can allow us to acknowledge what we have done and what needs to be done. Last week Harriet Loffler, Curator of Modern & Contemporary Art from Norwich Castle Museum and Art Gallery, visited me in the studio. We spoke of the project starting point, of collaboration, material and fabrication choices, of the forthcoming shows at the Castle and a reference to the Bayeux Tapestry I have been pondering. Thinking, writing, drawing, research and material play are all activities which need at some points to be open ended – oddments of ideas which can feel isolated and un-tethered to anything that has come before. But when these ideas are aired, some of them anchor to works already in existence and the project extends. When sharing works in development, questions pertaining to material or fabrication choices, for example, can help to solidify the choices which have already been made, whilst prompting questions about others. There just isn’t time to do everything and so reflecting on what demands attention is an important skill to develop and trust. The thought I had about the Bayeux Tapestry was actually a memory of a single image of King Harold being shot in the eye with an arrow. I couldn’t quite remember if it is a record of the battle of Hastings in 1066 (turns out it is) or who made it (it was a professional workshop production being some 70 meters long by 50 cm tall) (1). Sharing with Harriet this single image held in my mind’s eye, feeling unsure if it was important or not, and if it was – in what way, opened out a new approach to the drawings I am developing. The construction the Bayeux Tapestry uses several pieces of fabric, each being embroidered with a scene detailing events from the accession of Edward the Confessor to the defeat of Harold at Hastings (2). The images I have been developing, apart from a very small number of paired drawings, are of single figures, and I wondered if I might consider collating them into several larger works. I have to question what would lead me to put them all together. The subject of the drawings reference different art making or designer maker postures, but what would be the connection beyond that? Where is the narrative and is one required? Through the conversation with Harriet it came, perhaps it was a relatively simple revelation: that I am the connection between all these images. The project is largely of my orchestration, with the ambition being to collect the research resources needed to work up new visuals. Could I be the connection between all these people, and in so doing influence the ways in which the work is assembled and the images integrated? Being present in the work is not normally a place that I occupy; more often than not I fragment my own image or remove myself entirely. In this project I took the unusual step of using my own complete image in two case studies as Val and I developed a collaborative understanding of each other’s approaches and practices. Further I find there is there a possibly in this work that I could be the linchpin in this work; the pivot for the images I am creating. Reflecting now these ideas link with conversations I had with Gill Hedley in late November, and the project begins to take a form to test out in the world of exhibition proposals and applications. There are times when the studio needs quiet and the artist needs solitude, but also essentially at some point the work must be opened up for comment and questioning, and if this can happen in the development stage so much the better. There is no doubt about it, its good to talk. 1. Although the Bayeux Tapestry was a professional production, throughout the nineteenth century it was attributed to Queen Mathilda, wife of William the Conqueror. The queen was presented as an exemplary embroiderer, working with other women in private and for her husband’s glory, not her own. George Elgar Hicks painted Queen Mathilda with the Women and Saxon Maidens with the Bayeux Tapesty in 1899. Taken from Rozsika Parker’s The Subversive Stitch: Embroidery and the Making of the Feminine (The Women’s Press, London, 1984) p. 26 and plates page which follows. In the wilds of Suffolk, there is a beautiful unusual house. Contained within that house is a studio and a multi-functional table where ideas are explored and work is developed by artist Les Bicknell. In these spaces paper is cut and folded and production lines of the artistic variety are imagined, modified and executed to create artworks which beguile and challenge. When we arrive a selection of tools have been laid out on the table in the main living space: these draw immediate interest. 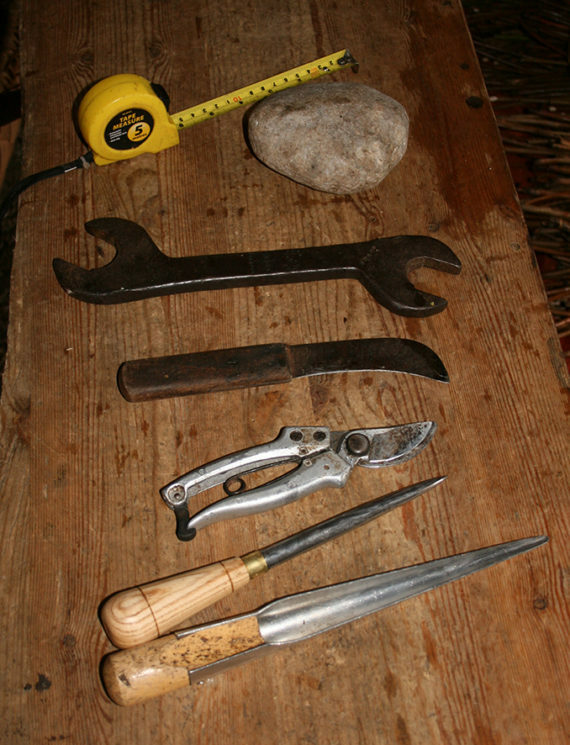 Tools have potential, they are inexorably linked to skill, practice and repetition and although some may be universal it is the way in which individuals will hold, use, and adapt these objects which contributes to our continual fascination. When we start to ask Les about the tasks and processes he employs it’s not long before a series of demonstrations are underway. The first of these is cutting paper using a scalpel on a cutting mat, a task which he has been repeating for over 30 years. The pressure exerted when cutting varies according to the material, but the repetitive action has resulted in his right finger taking on what he considers to be a misshapen appearance. Our bodies change over time regardless of the degree of care we take of them, and repetition of any kind when it extends over a significant time period is bound to have both aesthetic and physiological implications. Cutting is followed by folding. For Les there is a “sort of meditation around paper folding, repetition is conceptually grounded in the politics of making more than one”. He has repeatedly returned to the same fold over a number of years and through this continues to make and explore new possibilities. The crease of the fold can be smoothed by the fingers or a bone tool which is used to when extra definition is required. This bone tool has been adapted, one edge has been sharpened so it can be used with a ruler to score a surface and to facilitate very precise folds. Whereas once he may have produced an edition of 100, this may now be less than 10. Even with this reduction in quantity repetition remains a key feature of his practice: the transformation of a pile of paper through cutting and folding to a pile of objects, artworks, still brings pleasure. When talking about his work Les makes references to family work occupations and specifically his dad and uncle, both of whom worked in an engineering factory. “I would walk through the factory to my dad’s work bench, I watched my dad making stuff”. From school Les had the opportunity to take up a number of apprenticeship roles across a series of manufacturing facilities in Coventry, but wanted to get away from factory life so went to art college. He has noticed how in his art practice he is drawn back to the factory way of life: creating mini production lines, paying close attention to work organisation, making tools and temporary guides to aid batch production processes. 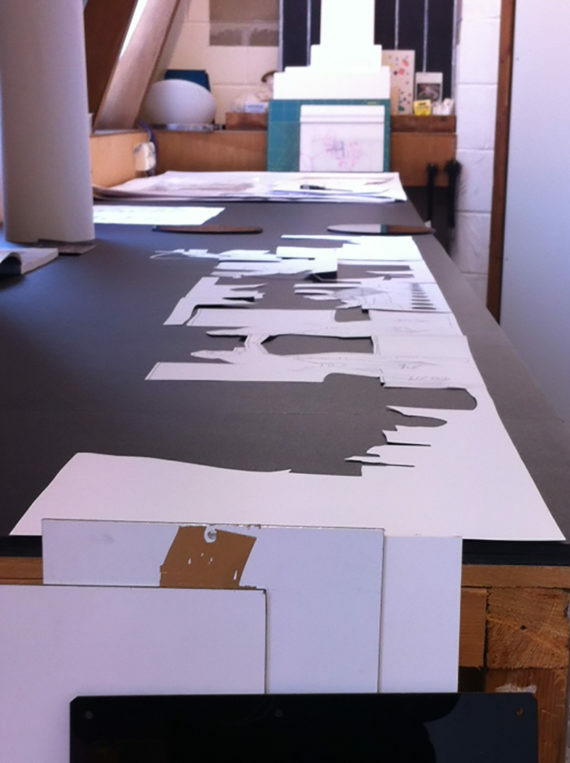 As the making of an edition progresses the place in which tools and materials are laid out alters as Les works towards finding the most productive work fit. This ability and opportunity to adapt work flow, work organisation and order of tasks is a key benefit of being self employed. There is a physical benefit to this freedom, as work can be undertaken in a more comfortable manner, but in addition there is the psychological benefit of knowing there is control over work flow. Les is aware that he likes to be in control of things, organising and being efficient. This extends across both practical work and the ways in which he runs his business. His control over deadlines is such that work is finished at least a week before it is needed; there is no writing artist talks on the way to a venue. There is clarity about what he can do and what services he pays for, which contributes to the efficiency in his working methods. When we first ask him about solitary working, he says how much he enjoys spending time working alone, but later it transpires he has other people around at the end of the day to discuss work with, and so he ponders on how much solitary work he actually undertakes. The impact of organising work in these ways and feeling happy with that organisation must surely result in a reduction or avoidance of stress that can be brought on by managing a wide variety of tasks and activities with varying deadlines. Les categorises his postures into two main areas, standing and sitting. He has specific postures for the components of his practice: “I am standing when thinking and teaching and sitting when folding and cutting”. The postures associated with these distinct activities have developed over years of art practice. The development of the idea, working out the solution to a problem and demonstrating a process or technique to students is often carried out when standing, moving even. 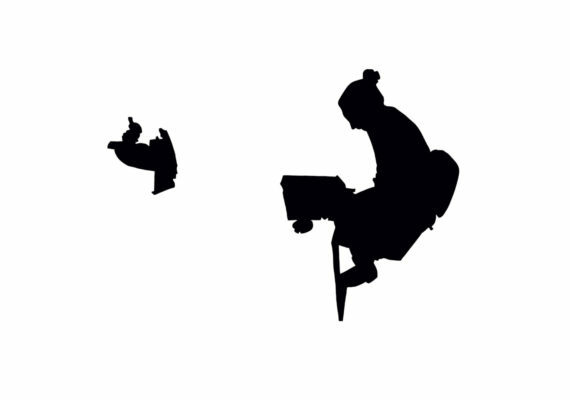 While cutting, folding and computer work accesses the relative stillness of sitting to be effective. Les thinks he has been in pain for about 20 years due to repeated use of a heavy printing press he used almost daily early in his career. The use of a press requires the ability to twist whilst exerting pressure to drive the press forward through the rollers. There is a flow but the press comes to an abrupt stop which can jar the body. The press must then be reversed, causing the body to twist again. Multiply this action over the course of a long working day, on consecutive days, and the effects can cause irritation and discomfort. From the description Les offered, Val suggested the main muscle which has been effected might be the right Trapezius, one of the major muscles of the back, responsible for moving, rotating and stabilising the scapula (shoulder blade) and extending the head at the neck (1). 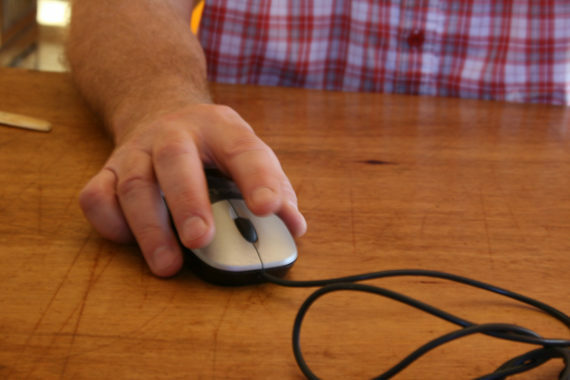 What is interesting is that pain caused by the large physical movements needed to work a printing press (which Les no longer uses) now reappear when engaging in the light touch activity of using a computer. When the computer mouse is used too often or for too long he gets shooting pains into his neck. “If it’s a busy time I either work through it and be in pain, because that is the nature of the job, or I manage to do something else”. The duration of this pain varies, but usually dissipates by the next morning. Ignoring pain signals is something many people can relate to, and for the self employed, artist or otherwise, payment often only comes on completion of work. Ceasing to carry out a task or process which causes pain and discomfort may in itself not be enough to remedy the issue. Pain can manifest itself again when undertaking an entirely different task. For Les it was moving a wheelbarrow full of clay which triggered 20 years of aches and pains, which had in effect never gone away. Discomfort, pain or an injury that occurs in the early stages of our lives can have implications later on in life which may lead to all manner of work task, work set up or work place adaptions being required. Les works from home: the large cold workshop in the garden is largely unused, his current practice doesn’t require that kind of space so it is his studio room and the multi-functional table in the main living space where work takes place. The chairs in both these spaces don’t give an enormous amount of back support, and he has an awareness of how “badly I am sitting”. He says he’s “not interested in anything else, not focusing on the body, but on the action of my mind”. This kind of absorption is something many people can relate to through activities in which we are engrossed, and subsequently remembering to change position is forgotten. When asked what is the best posture, many physiotherapists will reply the next posture. Being static is bad for our bodies, we weren’t designed to sit for hours or to repeat tasks; but that is in effect how the majority of work is now designed. As self employed artists we have an opportunity to design our own tasks, their order and their place within our working week. If we have the time and resources we can work towards mitigating the potential difficulties caused by static postures and repetitive actions, and thus preventing pain and discomfort from developing. The Postures of Making project is moving forward, with the production of prototypes and other large scale experiments. Essential to the development of the visual work is gathering further source materials to work with. At the end of November Val and I went to meet Dovile Bertulyte at her studio at Cockpit Arts in London. 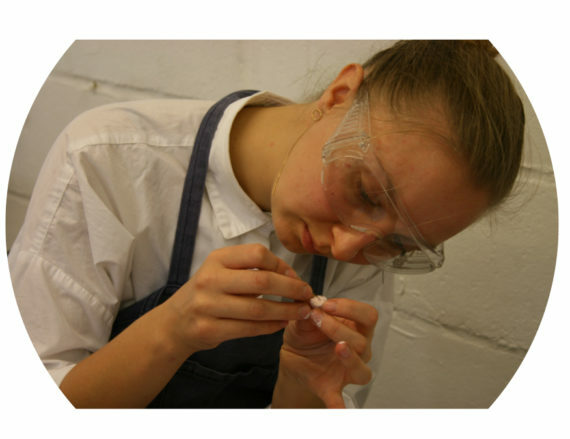 Dovile is a Designer Maker Jeweller, and uses a range of processes in the creation of her work. On arriving Dovile takes us into her studio, a shared work space for 5 different practitioners. The room is warm – very warm – I’m not used to visiting studios as warm as this. The studio is lit from above with fluorescent strip lighting which she supplements with two bright spot lights on her bench. Dovile’s space is clean, tidy and well organised; she had just taken part in an open studio event. When we arrive all her equipment is neatly laid out, she said “I don’t always work like this, I try to keep my work space tidy but I always seem to make a mess”. The space is compact but also suitable for the work she is making. She has designated areas for specific processes and she can move the different work areas around and does so regularly to refresh her space. We started by asking Dovile about the types of tasks she undertakes. When detailing her production methods she talked about them as being time consuming and repetitive. There were lots of stages and tasks within the different production methods that she employs. 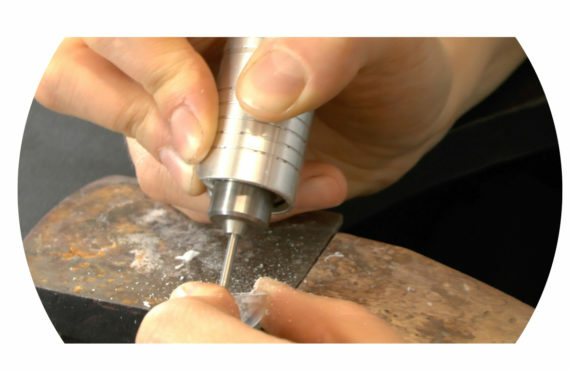 We selected 4 tasks to look at in detail: drilling a perspex mould, preparing and using silicone in that mould, extracting the work from a mould and soldering. Val and I took audio recordings and documented with photography and video. For the first task, Dovile drilled a perspex mould that she uses in her silicone casting process. The task starts with fixing the drill bit; the hands take on some extreme looking postures but these are fairly infrequent, perhaps once an hour, and so don’t cause any discomfort. Although the postures of the hands look awkward, the way in which the drill bit is changed and secured is smooth and dexterous. The drill itself is quite heavy, the cable that connects the drill to the transformer is also heavy and due to its short length, quite inflexible. Using the drill causes some pain and discomfort in her wrist after a period of use. Working in a very detailed way she holds the drill very tightly, evidenced by the whitening of the skin on her hands and at the tips of the fingers and fingernails. The drill is controlled by way of a foot pedal, the repeated use of which causes pain and discomfort in her foot and lower leg. She shuffles around and changes position to relieve some of the discomfort. Likewise, the object she is drilling moves between different positions on her bench and she does this fluidly and unconsciously. She works with one arm resting on the bench while the other is suspended in space holding the material that is being drilled. Her neck and arms are quite static, with most of the movement occurring in her wrist and hands. The longer Dovile drills, the more she leans into and over her work. At the end of this drilling cycle a red mark can be seen between the thumb and the forefinger of her hand. In terms of safety she is wearing protective goggles and an apron; sometimes she will wear a mask, but not always as this causes her goggles to steam up. In terms of noise levels the drilling we witness is on a fairly low scale; other pieces will give off a high pitched squeaking noise, so when this happens ear defenders are used. For the silicone processes, which can be quite messy, Dovile uses a different workstation. On first appearances it’s difficult to see how this set of shelves on wheels could be a comfortable space to work but as she angles them, they sit neatly into her body shape and create a comfortable work area. As she starts the task she talks about how she doesn’t measure the different elements that make up the silicone anymore; she has mixed it up so frequently now she can judge it by eye and by weight. Dovile needs to work fast, as the silicone will start to go off in about 20 minutes. Once mixed she works in an efficient and methodical manner, taking care to ensure the silicone reaches into all sections of the mould. Concentration and dexterity are combined in this time consuming task. There were no reports of pain and discomfort while conducting this process. Moving to another workstation, which is clean, she takes a silicone filled semi circle mould that has already set and goes about separating the two elements. She uses her thumb nails and finger tips and the work looks like an almost impossible task; but a short period of perseverance and the work is liberated from the mould. Observing these movements it evident that Dovile has perfected her working processes and has identified very efficient ways of working. The tube moulds are more difficult, and she used a metal ruler to try and force the two parts of the mould apart. During this process unfortunately the pieces snaps back together and the skin on her finger gets pinched. She uses her body to stabilise the work as she tries to manipulate the mould. Extracting the work from these moulds results in numb fingers. For the last task Dovile demonstrates the soldering processes that she uses. Sitting at her bench she organises all the tools and equipment she needs. 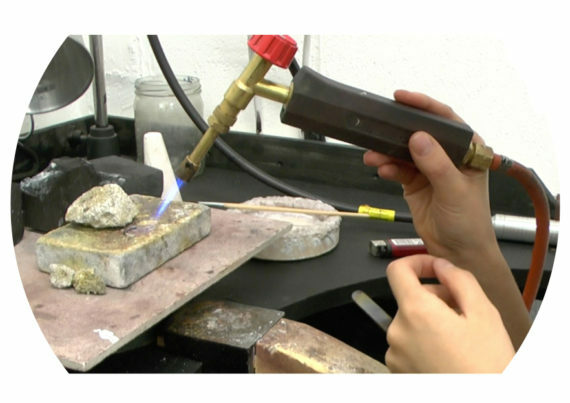 After lighting her soldering torch she uses tweezers to add pieces of solder to the metal being heated. She is constantly changing hands with the tools she is using, because she is right handed and this is her most comfortable way of working. She looks relaxed but also talks about how with long soldering tasks heat can build up quickly and with a studio that is already warm it can become quite uncomfortable. The soldering task takes little physical exertion, but obviously requires high levels of concentration. Dovile has developed a combination of processes that are all quite different, but she said that “I spend most of my time sitting”. When we are visiting there also seems to be plenty of moving around, locating materials and moving between workstations, but this may not be her typical pattern. She organises her work into batch production categories to be as efficient as possible; if she has a big order then the tasks can become quite repetitive. 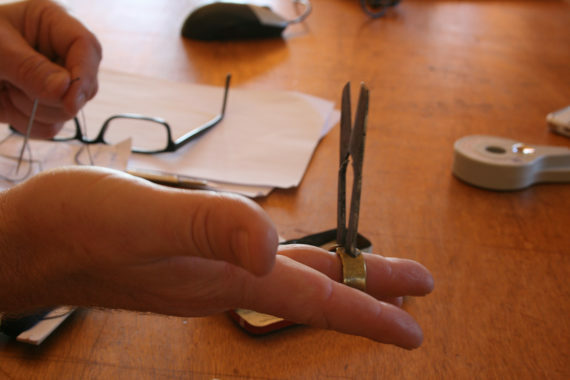 “That’s why I like being a jeweller; I can do lots of different things”. 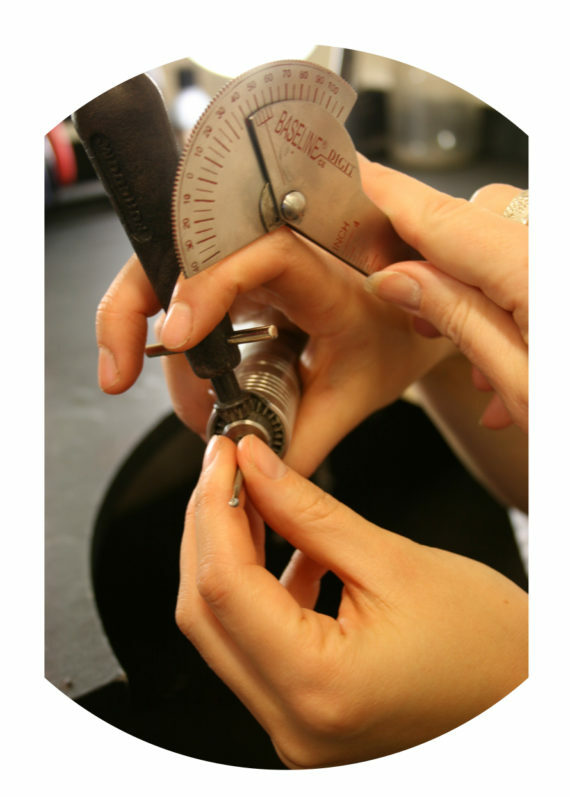 Most of the jewellery she makes requires a variety of tools or pieces of equipment, and of course she has developed the technical competency with them all. Being located at Cockpits Arts is positive for Dovile, as she enjoys being part of a studio group and a creative community. In common with lots of creative professionals, around 60% of her time is spent on admin, running the business, and doing all the tasks needed to support the production of the work. She also combines self employment with employment, working in a watch makers twice a week with the remainder of her time spent in her studio. Her total work-time mounts up to 70 hours per week. What was clear from this visit to Dovile’s studio is that she has a thorough and methodical understanding of the combination of methods she has developed. Her workstations are set up so she can work comfortably and efficiently. She stores and labels her raw materials carefully and knows where things are kept. She is in control of her pace of work and the order of tasks she undertakes, and although they all involve repetition to a greater or lesser degree she enjoys her work. Val and I extend our thanks to Dovile for hosting the visit: do visit her website to see examples of her work.